ok, this is my last posting. I live in Cape May Co. so this is my potentially most personally exciting find. I found this at a local junk shop that specialized in house cleanouts. Is this salt shovel the work of Philip Syng Sr or Jr? according to my sources, Sr did work in Cape May NJ for a few years (1724 - 1728). So far he is the only Silversmith I can find who has done so. 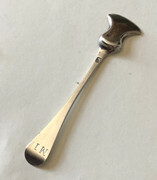 While I cannot prove that it was made locally it may be the closest I may get to owning Cape May Silver. 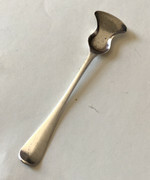 I have another Syng Spoon I believe, but I got that one in New England. Re: Philip Syng Salt shovel? I'm definitely not the last word on this, but I think it could be Philip Syng.